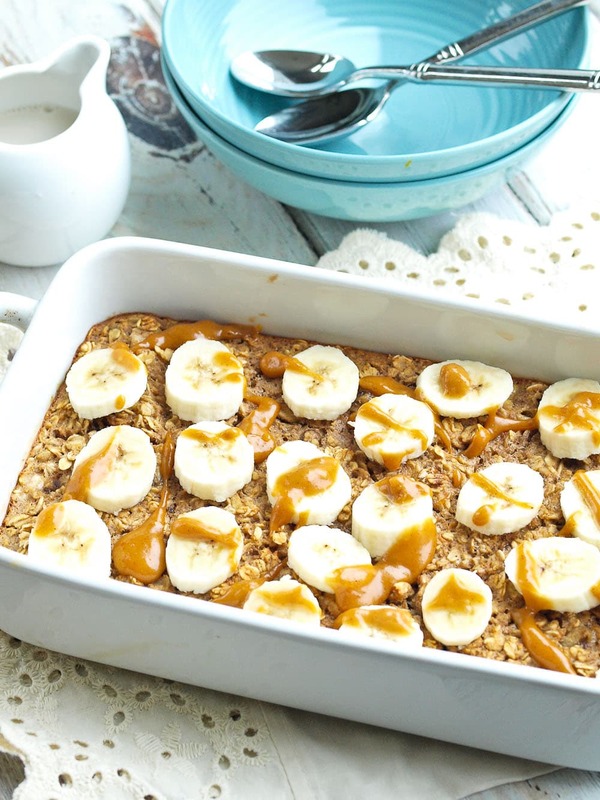 This recipe for Baked Banana Peanut Butter Oatmeal is healthy and simple to prepare! I hope everyone had a lovely long holiday weekend. For my non-American readers, I hope you had a lovely regular weekend. Either way, I took a mini-vacation from my blog, but I’m back with a hearty breakfast that is perfect for this time of year. There is nothing better than a warm breakfast on a chilly late autumn morning. Cold cereal just doesn’t do the trick. 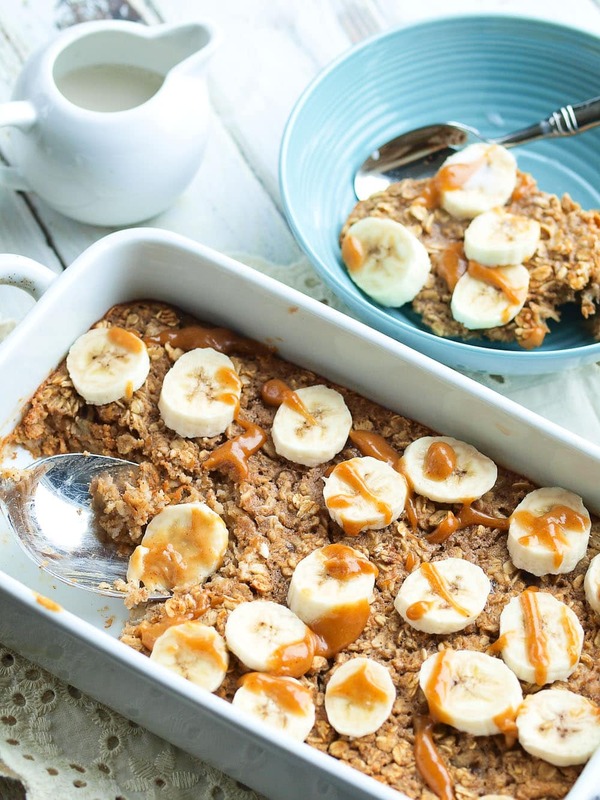 I love regular, creamy oatmeal, but this baked oatmeal is great for a few reasons. First, it’s an interesting cross between a bowl of oatmeal and an oatmeal cookie. You can’t go wrong with (healthy!) dessert for breakfast. Second, it creates leftovers that can be easily reheated for quick breakfasts the next couple of days after baking it. It even makes a great little snack when you cut off a piece and eat it cold, like a granola bar. Fork optional. Not that I would know anything about that. 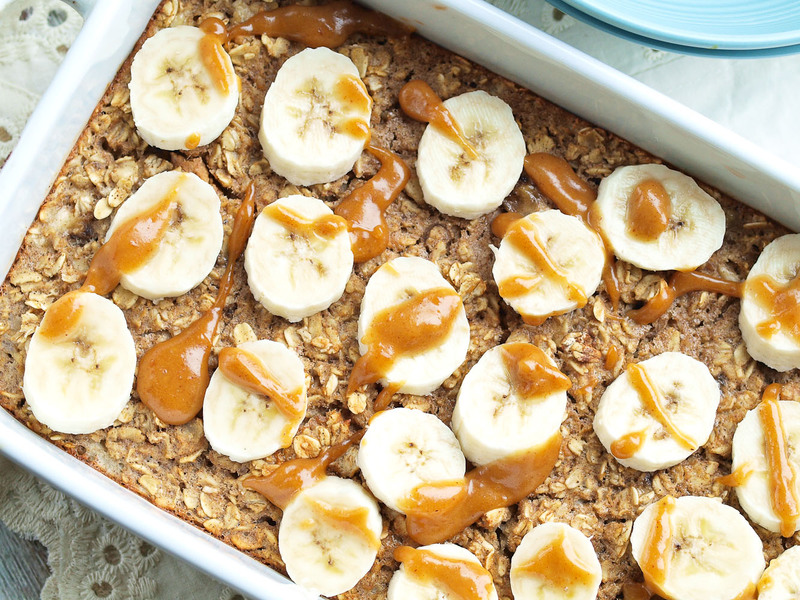 This is a healthy baked oatmeal recipe that is a snap to make! Mix maple syrup with peanut butter for the topping–it’s heaven! Preheat your oven to 375 degrees. Grease a medium sized casserole dish (I used a 2 qt. oval shaped dish) and set aside. In a large bowl, combine the oats, baking powder, salt, and cinnamon. Add the milk, egg, 1 mashed banana, peanut butter, maple syrup, and vanilla. Mix well. Pour the mixture into the greased dish. If you want to add the sliced banana before baking, it browns some but tastes delicious. Alternatively, add the sliced banana to the top after baking. I know I skipped my pregnancy update last week. In case you were worried, no, it’s not because I went into early labor. Baby is still cooking and I’m feeling well. 🙂 I’ll give you a double update this week. I was just enjoying the time with my family too much to blog. I hope you’ll understand. Have a great week and I hope you get the chance to try this baked oatmeal. It doesn’t disappoint. 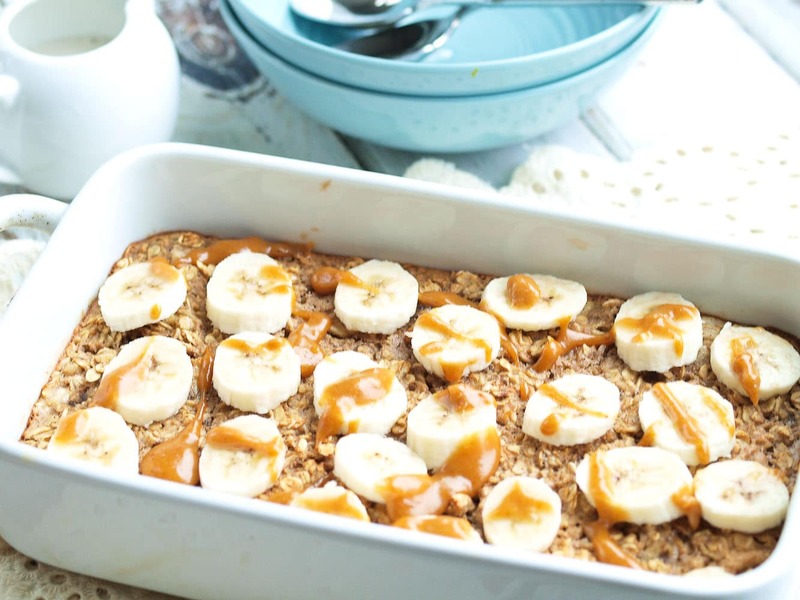 I love baked banana oatmeal. I’m surprised I haven’t tried putting pb inside the oats (i always spread on top) because it is my favorite combo! And I agree, love the leftovers for this-just like granola bars! I love having the leftovers for snacks! I store them in the fridge! It’s a mixture of peanut butter and maple syrup. It’s a really delicious addition! Sweet potato baked oatmeal! Great idea! Did you add any extra sweetener? It may not be sweet enough w/out the mashed bananas (at least for my taste). Let me know how it turns out! Did you cook the sweet potatoes at all before adding them in? Sounds delicious. Definitely going to give this a try. Thanks! I was just thinking about you earlier today and wondering how you were doing. This recipe looks good. I’m not a huge oatmeal fan, but I do like it baked. Thanks for thinking of me. I didn’t really plan on taking a long hiatus, but it worked out that way. Sometimes you just need a blog break. 🙂 I hope you’re doing well! The leftover factor is reason alone to make this! It’s wonderful to have a quick breakfast ready to heat up and eat. Baked oatmeal is my family’s favorite way to eat oatmeal! I love the leftovers too, and will even find my kids sneaking bites right out of the fridge. I haven’t tried putting peanut butter in mine, so I might have to make that addition! Meghan is a peanut butter freak, so that’s why I added it here. She seriously wants peanut butter in everything–it’s insanity. I’ve never tried freezing it, but I think I’m going to make a batch just for freezing now. Thanks! Can’t go wrong with baked oatmeal. I’ve only recently tried it, but loved it! It was great to make it on a Sunday and enjoy easy breakfasts the rest of the week! Yes, the leftovers are the best part! Does this work well prepared the night before, put in fridge, then baked in the morning??? Thanks! I think it would work, but I can’t say for sure. You’ve inspired me to try it! I’ll try it tonight and let you know. Hey Maryea-tried this today and it was delicious!! Thanks for all of your awesome recipes! For this one, do you find a serving of the oatmal with a piece of fruit is a good breakfast (filling, etc.)? Also, how do you store the leftovers (fridge or not, airtight container)? They weren’t bar-like when they were warm but I loved it! It will probably be even better tomorrow!!! You’re welcome! I do find it to be a good breakfast. I usually have a snack 2-3 hours after breakfast no matter what I have, but it definitely keeps me full until snack time. 🙂 I keep the leftovers in the fridge. Thank you so much Maryea! This was our first baked oatmeal, and it was delicious! My almost 2 1/2 year olds loved this. We made it the way you recommended, by baking it for 30 minutes and it was nice and soft in the middle, but stays together when the kids hold it. It really is a perfect snack for toddlers. We already ate half the batch, so I know we’ll be making this again very soon. I also wanted to thank Meghan for loving peanut butter so much that it encourages her wonderfully, talented mommy to create delicious and nutritious snacks for her (my son is the same way). Thank you so much! I am using this as a base recipe (minus the pb for the base and adding an extra egg for a touch more protein and binding) and mixing in berries, chocolate chips, and soooo much more for Jackson! I needs something easy AND healthy to take to daycare for him to eat for breakfast! This is perfect!! 🙂 Loooove this, Maryea! Thanks!! Looks amazing on a cold wintery day! Is that peanut butter drizzled on top after baking? I’ve been searching endlessly for an easy breakfast that will actually keep me full till lunch and doesn’t ruin my diet plan. This is the BEST recipe! Thanks so much! This baked oatmeal was a big disappointment. Texture-wise and flavor-wise it let us down. I’m really sorry to hear that. Can you help me understand how it fell short? What were you expecting in terms of texture and flavor and what it was like? I appreciate your feedback. Thank you for replying! I guess I was just thrown off by the caramel in the photo. I thought it would be much more rich in flavor. I didn’t care too much for the consistency when it was soft and gooey, nor as a bar. I made this on the weekend. It was great. I think it tasted better after it sat in the fridge for a day. I used both bananas in the batter. Next time I would like to try applesauce instead of bananas. Apple sauce would be great, too! What is the drizzle on top? Caramel? Looks delicious dear..but to those chef at heart, you may use quick cooking oats instead if you have it on your kitchen cabinet, it works well too, so you dont need to go out to buy rolled oats to save your energy going to grocery. Dhow many calories per serving? I loved how easy this was to make and how tasty it was! I baked for the full 30 minutes, but I think I might opt for slightly less next time– that’s the only change I’d make, though. Thank you for sharing such a great recipe, Maryea! I will definitely be making this again. What about using steel cut oats? Any ideas on how that would impact the recipe? Lastly, what about making these into a muffin pan? Any thoughts on how that would impact the cooking time? Thanks for the recipe!! I have not tried this with steel cut oats. I think it’d take a lot longer to cook and I’m not sure how the texture would be. I’d love to hear how it turns out if you try it! Could you use a flax egg substitute? So for the folks that say it was super gummy and/or to use instant (quick cook) oats I’d like to chime in with a few thoughts on that. I make this EVERY week. I half the recipe since it’s only for me and I have breakfast for the week. I tried it with rolled oats first and wasn’t a huge fan of the texture because it was kinda chewy/hard. Then I tried it where I ran the oats through my blender/food processor for a few pulses and LOVED it. Then I thought, maybe I should try it with instant oats? BAD IDEA. IT was super gummy and I did NOT like it AT ALL. So, every week for the last month I’ve used rolled oats that have been pulsed a few times in the blender. Also, even though I half the recipe, I use a whole egg because really, what do you do with HALF an egg? I also top it with a teaspoon of PB after I’ve reheated my portion for the day and frost it like cake. 😀 It’s fantastic with raspberries too! I also eat a hard boiled egg with this and it keeps me full for 4 hours. I’ve shared this recipe with SO MANY people I love it so much! 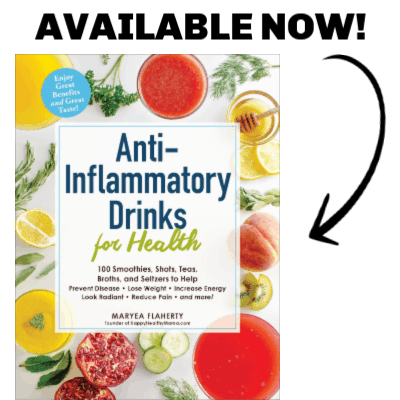 Emmy–thanks so much for chiming in and letting everyone know what has worked for you! Just an update….I’ve still been eating this almost every week. It might just be me but once I find something I like that’s easy it’s an easy fall back recipe. Even when I’ve taken a little hiatus I fall in love with it all over again. I wanted to update my comment that if you use Quaker Rolled Oats there’s no need to pulse in a food processor. Trader Joe’s Rolled Oats are a slightly thicker cut so they definitely had more chew but Quaker Rolled don’t need to be messed with at all. Since my last post, I’ve shared the recipe with at least half a dozen more people (mostly in my office because they always ask me what I’m eating and I let them sample it) who have all really enjoyed it. Out of curiosity do you have a calorie count on this? Curious if you had thoughts on calorie count when you 1/2 the recipe but use the whole egg. Can I just calculate approx. calories for each ingredient and use that? Thanks for the update Emmy! 🙂 I will run this through my nutritional calculator and get back to you. I love this. I made it 2 times so far. And I will keep making it!! Thanks for letting me know, Sara! Hi! I just made it and my house smells amazing! I forgot to add the egg! Do you think it would be okay? Yes, it should still be fine! It will probably be more runny or like regular stovetop oatmeal, but shouldn’t be an issue. This recipe looks great. Have you ever put it together the night before, refrigerate it, and bake it the next morning? If so, how did it turn out, okay? Yes, I have done that, and it works well! Looks delish! Can I prep the night before and bake in the morning? Mornings are a little crazed in our house. Yes you can! I’ve done this multiple times with no issues. So glad to hear you and your husband liked this! 🙂 Thanks for the feedback! I found this recipe and made it tonight in order to have my breakfast ready for tomorrow. I sampled it and had to stop myself!! Its like heaven in a bowl!!! This is a definite winner!! Any idea the calories in the PB Oatmeal? I’m doing WW but wanted to give the recipe a try. For starters, I never post reviews on anything but oh my goodness! This recipe was amazing! Not only was it insanely easy to make but my whole family loved it. Even my picky two year old. This recipe is going to be a staple breakfast in our house!!! The recipe was to dry and the cinnamon was overpowering. Not my favorite. I’m sorry to hear this wasn’t your favorite. It’s definitely been a family favorite and reader favorite for years.